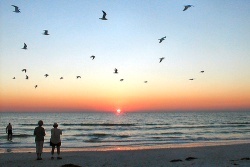 Consider Sarasota getaways for your next winter vacation or romantic weekend getaway celebrating a special occasion. Sarasota is set on a Gulf Coast Bay behind a beautiful chain of long "Key" Islands, seen in the background of the photo above. This city has a winning combination of culture, restaurants, sights to see and beautiful white sand beaches for great Florida getaways. Fly into nearby Sarasota airport which is quite small or the busy Tampa airport, which is about 1 1/2 hour North or Sarasota. Walk to beach and St Armand's Circle! Be swept away to luxurious Spain in this beautiful one bedroom guesthouse overlooking a lovely pool. Spacious outdoor dining room, Mexican tile throughout, short walk to beaches, pool, high speed internet access, full size kitchen, short 1 minute walk to world famous St Armand's Circle. Hyatt Regency Sarasota - Resort type setting and private marina, decor elegant with clean lines, lovely views, pool with waterfall. Hotel Ranola small hotel with kitchens located downtown near Main Street for Sarasota Getaways near restaurants, harbor and more. The Cypress Bed and Breakfast is a lovely historic home overlooking the bay, walking distance to town, cocktail hour and great hosts. A unique place to stay on romantic Sarasota getaways. Boat tours - Sarasota Bay Explorers (at Mote Aquarium) 1 1/2 hour pontoon cruise around bay, guided by a marine biologist and Miyakka Safari Tours, narrated airboat trips through Myakka River State Park. Check out nearby St. Armand's Circle where you will find designer names at over 100 boutiques and shops. Antique lovers will enjoy the Antiques Gallery of Sarasota, with 6500 square feet of a wide variety of items, furniture and accessories. For romantic Florida Getaways, check out Marina Jacks Restaurant with it's theater-style seating and fantastic panoramic views of the marina, downtown and the Bay. Also, for fine dining there is The Colony Dining Room, an award winning gulf-front restaurant on Longboat Key. Moore's Stone Crab, located on Longboat Key, is a unique very casual Florida restaurant featuring broiled and fried oysters. It's delicious....I've eaten here! For a change of pace, try Heinrich's German Grill, a cozy, bistro with great food and German beer, Solorzano's Italian Restaurant, or El Toro Bravo for great Mexican food.